Product prices and availability are accurate as of 2019-04-20 04:02:10 EDT and are subject to change. Any price and availability information displayed on http://www.amazon.com/ at the time of purchase will apply to the purchase of this product. 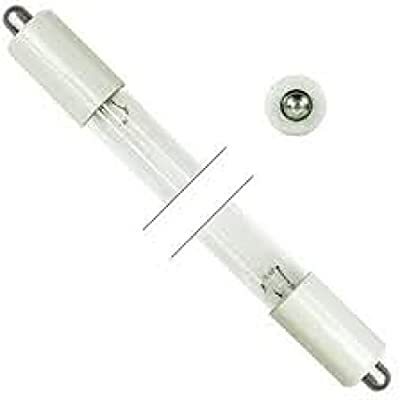 You are purchasing one unit of the aqua treatment services ATS1-805, ATS1-805VH UV bulb used in DWS-6, DWS-7, SE-7, DWS6, DWS7, SE7 10,000 hour long life lamp 6 month warranty includes free gloves for handling 16 watts UV hot cathode germicidal UV bulbs (UV-C), are low-pressure mercury arc lamps that are the most effective tool for eliminating microorganisms such as virus, bacteria, mold and yeast in the air and impurities in water. Produces UV-C (253.7 nm wavelength) radiation (harmful to eyes and skin). Specifications: Part number: ATS1-805, ATS1-805VH UV Bulb used in DWS-6, DWS-7, SE-7 FAMILY: Germicidal UVC Lamps wattage: 16W voltage: 50 Amperage: 0.425 Average life: 10,000 Hours base type: 1 Pin pattern: Single pin bulb shape: T-5 (T5) T5F length: 14.06 in. (357mm) family: Germicidal UVC lamps diameter: 0.61 in (15.5mm) ultraviolet put-put: 5.3 Watts ends: Double ended bulb finish: Clear burning position: Universal burn output: UV-C spectral peak: 253.7Nm compatible bulb to meet or exceed manufacturers specifications and performance. Buy wholesale from the importer.